Like many of you, I’ve been listening to The Union via the preview at NPR.org that is available through today (Monday 18 October 2010). Additionally, I was accidently blessed with an advance copy a couple of days ago. There are two versions. One is the standard 14-track version which I consider to be the abridged version–and the “Deluxe CD+DVD” version which includes two additional, essential tracks; a different track sequence; and a short DVD by Cameron Crow that is both informative and inspirational. According to EJ.com and other sources, an extended version of the DVD is forthcoming as a separate purchase during the months ahead. As an fan, make sure that you get that Deluxe CD+DVD. The Union as a title seems so appropriate in so many ways. The title–included in the lyric for Gone To Shiloh–obviously refers to the union of Elton and Leon Russell. But beyond that, it is a union of other indispensable talents, most notably T-Bone Burnett who is known for his honest, down-to-earth production. And it is not mentioned enough that there is the very special contributions of Bernie. His lyrics are wonderfully Taupin, with lyrics juxtaposed to transcend their literal meaning–to me that is what is so great about his writing. Less obvious is the important role of Elton’s U.S. manager, Johnny Barbis who been affiliated behind the scenes with Elton’s recordings for years and facilitated the connection with Leon. And of course, there is a whole assemblage of other guest artists who’ve come together, lead by Elton, in homage of this union with Leon. I see this album as a marriage of many talents, a grand event not unlike a wedding party with many guests. The extensive essay by Elton in the CD booklet is hugely inspiring. On one level, Elton shares why Leon was so important to the music we love from Elton, the Beatles and so many others. Elton reviews why Leon mattered; why Leon still matters today; and how this has been such a triumph for Leon. But I was equally moved by how working with Leon transformed Elton. It feels as if working with Leon might almost be Elton’s biggest spiritual transformation since he befriended Ryan White. Musically, this album seems a culmination of not only what Elton sought to achieve on his last three albums with Bernie, but also of what Bernie sought to achieve with Farm Dogs. The Union is honest, rootsy, spiritual, wry and deeply moving. We have the earthiness of Farm Dogs’ albums. There’s the back-to-basics Americana of Songs From the West Coast. There’s the gospel introspection of Peachtree Road (a fine album, that can be hard for me to listen to since I find it so melancholy). And by working with Leon and other greats like Neil Young, Brian Wilson, and the diverse cast of great studio musicians, The Union in a way tells the story of The Captain & The Kid in a new way by making more music just like the kind they were taking about on that autobiographical album. Add Leon and T-Bone and I hear these sounds that are like a Salvation Army band working in an old New Orleans loft. If It Wasn’t For Bad? It’s all good! I don’t want to spoil everyone’s first impressions, but I figure by now more than a few of you have heard If It Wasn’t For Bad. Written by Leon Russell, the lyrics are another song about troubled personal relationships, just like his classic This Masquerade which he co-wrote with George Benson. The track has a certain tension, moodiness and a sense of denial and irony that caused me to chuckle at the absurdity of the character’s position. Is that Elton in the left channel playing the moody, funeral-fugue-like piano figures? Or do I have my headphones on backwards? That is my favorite part, along with the Salvation Army-like tubas and other horns which add a droll sense of humor to the personal drama. Some advance reviews have suggested Etlon and Bernie’s fans should brace for something so different that they will need to give it a few listens. More than a few fans will agree, especially with regard to production. But I don’t think it is that different: I found Elton and Bernie’s songwriting to expound on certain chord structures, piano figures and lyrical themes that they have been exploring in the past decade. I guess that is why I think this album exhibits the culmination of their writing collaboration from the past 10-12 years. For example, The Best Part of The Day reminds me just a little bit of Mansfield during the refrain, but then the organ solo is reminiscent of I Can’t Keep This From You. But clearly this is an entirely new and different song. It is not repeating the past–but I do think it is like the artist further exploring the same brush techniques. This sort of thing, along with the way Bernie juxtaposes certain words, that makes it so fitting to me that Bernie is also a painter. Never Too Old (To Hold Somebody) was a track that was performed by Elton solo during last spring’s shows. I’m not clear as to why it was out there, but I did hear Elton’s performance from Austin, Texas, and, at the time, I was a little disappointed. In contrast, the studio version shows why Elton clearly loves the track. 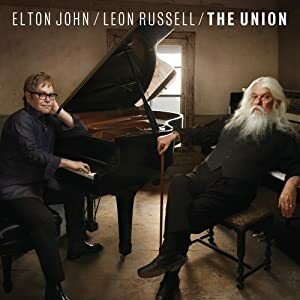 It’s a brilliant, slow, moving gospel build that takes on special poignancy given Leon’s comeback, as well as how Elton, Bernie, all of us are aging. The studio version gives me chills. If that live version from Austin was authorized, I don’t think it served the album as well as it should have; if it was unauthorized, I think its inadvertent distribution release stands as an example of why artists deserve control over bootlegs. Fever Dream or Out of Body Expression of Gratitude? Never Too OId comes across to me as the album closer, a real climax. Yet, afterwards is this gorgeous, heavenly track, In The Hands of Angels. Here’s my “fever dream:” I speculate that the track was added on by Leon as a post-album “thank you” to Elton and Johnny Barbis. It is written by Leon alone and does not feature Elton, according to the album credits. In an interview with Leon–I think it was at ej.com–he says that Elton and Johnny treat him “like a king.” In the lyrics. Leon sings, “Johnny and the governor/came and brought me/to my senses/They made me feel just/like a king….” He continues on and it sounds like “Johnny and the governor” just might be Johnny Barbis and Elton. Hey, I could be wrong, it could just be my fever dream. Favorite tracks that I can’t get out of my head: If It Wasn’t For Bad, Eight Hundred Dollar Shoes, Gone To Shiloh, Jimmie Rodger’s Dream, There’s No Tomorrow, The Best Part of The Day, I Should Have Sent Roses, When Love Is Dying, Never Too Old and In The Hands of Angels. Yes, that’s a long list and the album is that good. In the vein of how East End Lights new album reviews used to end, it’s better than Songs From The West Coast and as good as Tumbleweed Connection and Madman Across The Water. I’m writing this over a cup of coffee at Starbucks; as I finish they have started playing The Union in its entirety. What a great but ironic omen! But so much for my earlier comments about The 22nd Row avoiding “I heard Elton on the store muzak” threads. So hopefully this hasn’t spoiled your first listen too much. What other ways do you thing the title “The Union” applies to this recording? What theories and evidence do you have about the songs? How do you interpret them? I look forward to your comments. (Click the link right below or email comments((AT))The22ndRow((DOT))com. This entry was posted in Album Discussions, The Union. Bookmark the permalink.